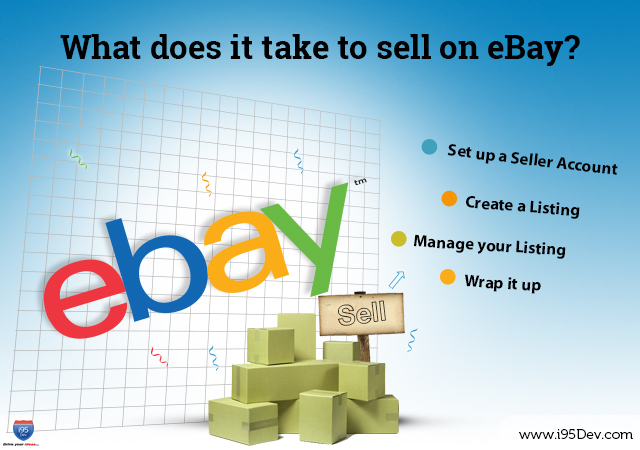 What does it take to sell on eBay? Multi-channel is the buzz word today; most businesses today leverage every possible channel to increase sales. They no longer limit themselves to their traditional physical store or eCommerce store but also leverage other channels like online marketplaces and social media to further reach their customers. This is the first step to sell on eBay. It is an easy process and eBay has gone to great lengths to make sure that setting up an account is a smooth process. In addition, make sure that you register and verify for PayPal as well; this would simplify accepting and receiving payments. The next step after setting up your seller account on eBay is to list all your products. Make sure that you provide all the product information because it not only helps build trust with your customers but also because eBay makes suggestions (similar products, cross-sell and up-sell) based on the product information you provide. These recommendations help you get noticed and sell faster. Note, there is a fee is associated with selling on eBay. If you already own an eCommerce store then you must also consider integrating eBay with your eCommerce store to manage your product information at a single location. i95Dev’s eBay connect integrates Magento with eBay and ensures that all your product and inventory information is automatically synced between the two systems. It is not enough to just list your products. It is equally important to frequently check and update your listing with any changes, like inventory changes. With businesses selling across multiple channels it is common for businesses to lose track of their inventory and over sell (or under sell) your products. If you undersell your products then you lose sales and if you over sell your products it adversely impacts your customer experience. Hence efficient information management is critical for customer satisfaction and the success of your business. You should also keep an eye on sales made and identify patters/ trends to further improve sales. Lastly, once you have received a sales order fulfill your order as soon as possible and notify your customers (email and send shipment tracking number). eBay has a rating system and if you were to maintain/ improve your rating you not only benefit from reduced commissions but also increase your chances of getting noticed (eBay would first show products from top rated sellers). What are your thoughts on it? Share your feedback and suggestions by commenting below.